Petite Double Arch Address Plaque - - 7" x 3.5" personalized address sign. Designed for locations that do not require large numbers, typically an apartment complex or where the viewing distance from the street is in the 20' range. Made in the USA. This sign size also works well for interior office or suite numbers, apartment, town house, or condo numbers, and individual hospitality unit numbers. 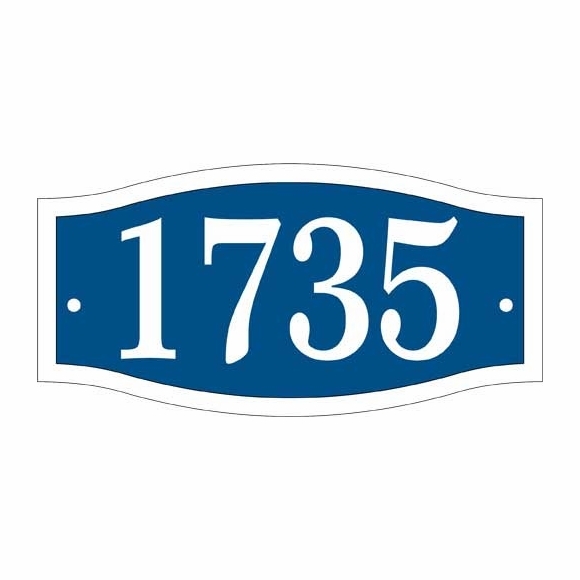 This double arch wall mount plaque holds one line of numbers or characters. Line 1 will hold up to three ( 3) 2.5" characters or up to four (4) 2" characters. Note: the style number on the larger sample sign is for internal use only and is not engraved into your custom sign. Border is the same color as the personalization and accentuates the double arch shape. Dimensions: 7"W x 3.5"H x 1/8". Personalized address sign for locations that do not require large numbers, typically an apartment complex or where the viewing distance from the street is in the 20' range.